The Luminox 3001 Original Navy Seal and the Luminox 3051 Navy Seal Colormark are two of the best selling Luminox watches at TacticalWatch.com. We often get questions about the differences between these two popular styles but the problem is that there are very few. Both watches feature the Ronda 515 HH6 movement, 200 meter water resistance, mineral glass, rubber straps and, of course, the famous tritium illumination system. When it really comes down to it, the real differences between these watches are the looks and size. 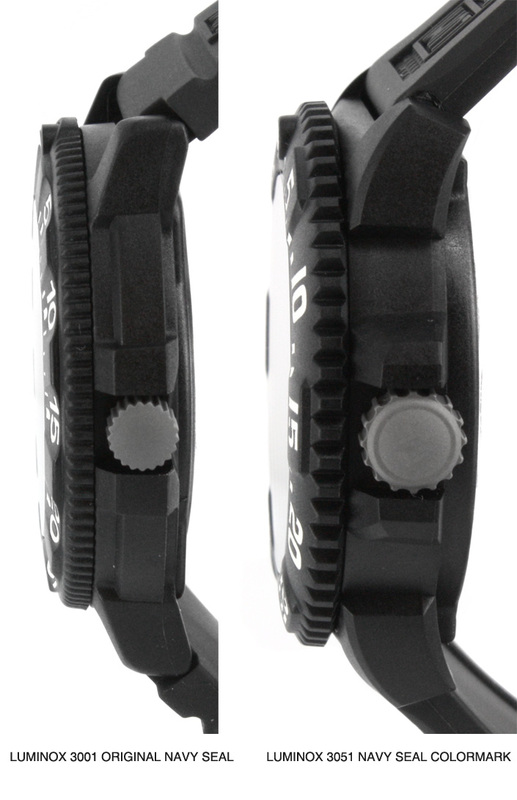 The Luminox 3001 has a 43mm case, 10.97mm height and weighs about 46 grams. The Luminox 3051 offers a bit larger styling with the 44mm case, 13.88mm height and weighs about 54 grams.